These Terms and Conditions apply to the ACA Health Benefits Fund Two Free Gold Class Movie Tickets (“Offer”), and information on the Offer forms part of these Terms and Conditions. Acceptance of the Offer is deemed to be acceptance of these Terms & Conditions. This Offer commences at 9:00am (AEST) on 14 January 2019 and closes at 5.00pm (AEST) on 28 February 2019 (“Offer Period”). Under the Offer, the Promoter is offering Two (2) Free Gold Class Movie Tickets. The Movie Tickets are subject to the terms and conditions of use of the relevant supplier(s), those stipulated on the tickets including expiry date and is not replaceable if lost, stolen or damaged (“Movie Tickets”). the Offer is not available to existing ACA Health Benefits Fund Limited ACN 128 673 923 policy holders for policy upgrades, when a spouse/dependent is added to an existing policy, or for standalone Hospital cover or Extras cover. Two Free Gold Class Movie Tickets for Eligible Customers on all combined Products taken out during the Offer Period that normally require payment of policy contributions under the relevant Eligible Product. 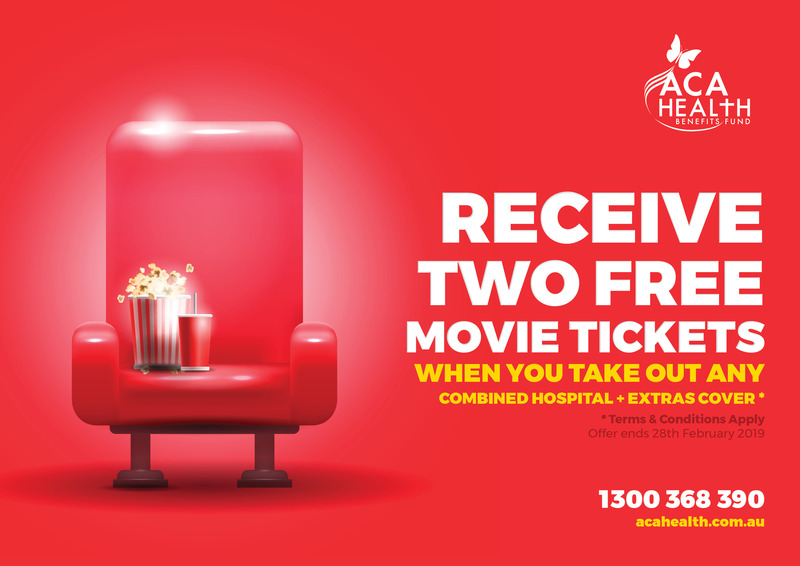 The Promoter will mail the Two Free Gold Class Movie Tickets to the Australian residential address provided to the Promoter within 30 days once the first month membership premium has been paid. Applies to all combined Products and excludes waiting periods on Hospital cover (“Waiver”). Only Two (2) Free Gold Class Movie Tickets will be awarded per policy. If there is more than one policyholder (couples and families), the primary policyholder will be awarded the Two Free Gold Class Movie Tickets. The Two Free Gold Class Movie Tickets are not transferable, exchangeable, or substitutable for cash and cannot be combined with any other offer or discount from the Promoter. If the Offer or redemption of the Offer causes the recipient to incur a tax liability, the recipient is liable for payment of such tax. If for any reason the Eligible Customer does not redeem the Two Free Gold Class Movie Tickets by the expiry date stipulated on the tickets, then the Movie Tickets will be forfeited. The goods and/or services provided by the Promoter through this Offer comes with consumer guarantees under the Australian Consumer Law (“ACL”) that cannot be limited or excluded by these Terms and Conditions. Except for this liability under the ACL and any other liability that cannot be excluded by law, the Promoter (including its officers, employees and agents) excludes all liability (including negligence), for any personal injury; or any loss or damage (including loss of opportunity); whether direct, indirect, special or consequential, arising in any way in connection with this Offer. Once the Movie Tickets have been dispatched and to the extend permitter by the ACL, the Promoter will not be responsible for any delay to deliver the Movie Tickets.